Darren LeSarge: The building was electric that night ! I was 10 yrs old and my dad took me to see Gretzky but the Leafs and Terrion stole the show ! Joan Deering Greg Terrion grew up on our street in Deloro and was best friends with my son David. 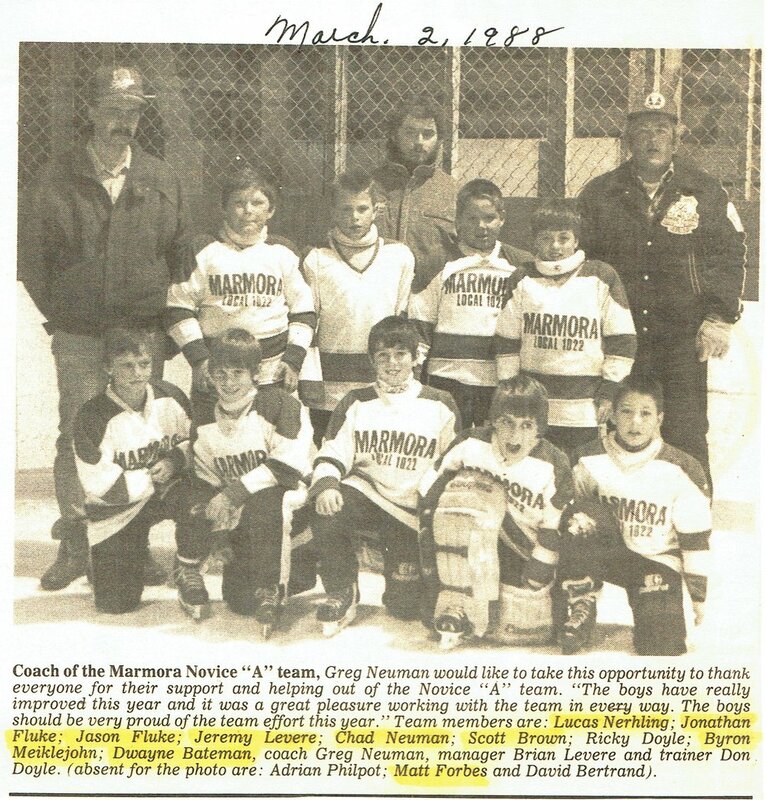 Nancy Chapman Hart: Greg was a awesome hockey player so proud of him thanks for sharing! Marlean McLean: My husband being a true Leafs fan has told me this story several times but I never saw the photo until now. Great share! games away from home was horse drawn vehicle , cutters or sleighs. Sometimes nearly as many local hockey supporters travelled to Stirling, Madoc or Campbellford as those that would attend the game from the host village. their home ice for games against other teams. 1910 Marmora Hockey team were winners of the Trent Valley League for 1910. Jan 28, 1915 To add interest to the contest for the championship of the Trent Valley Hockey League, Mr. Robert Cooke, M.L.A. has donated a beautiful silver cup which is mounted on an ebony base to be held by the winning team from year to year. Feb. 10, 1938 Gus Leonard, fast skating forward for Marmora High School team is also playing a star game for Stirling in the Trent Valley League. On Monday he was given his first penalty in four years of hockey. He is the youngest player on the Stirling team and perhaps the youngest player in the League, and hockey fans and reporters predict a bright future for him. A fast and smooth skater, with a poke c heck that breaks up many an opponent's rush, and a hard accurate shot, he should develop into a star on any team.